The ocean is powerful. It can lift and propel you forward, or pummel you and pull you down. A few good experiences in the waves builds respect, awe and wonder. Becoming one with that power, learning to go with the motion rather than fight, is a skill that can take years, even for surfers. 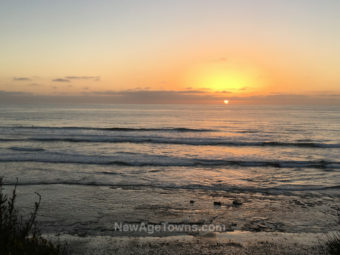 That oneness is at the core of New Age spirituality and it pervades the town of Encinitas in North County, San Diego. There are close to twenty surf shops in town. Most of them are along the Pacific Coast Highway (101), but some are inland as well. Even more are in neighboring beach towns Carlsbad and Solana Beach. There are board shapers too, who can custom make you a board. And of course there are year-round schools who can get you jumping up and falling down in no time. All you need is a wetsuit and some tasty waves and you’re good to go. 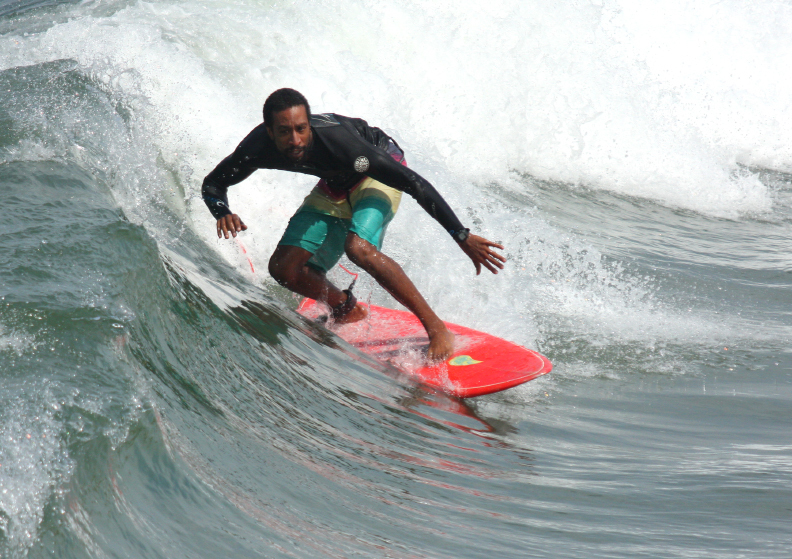 One thing to keep in mind, however, is that surf culture is not the same as beach culture. The Encinitas beaches are not wide and sandy like the Florida beaches or those around L.A. and Orange County. There’s no concrete strand. There aren’t volleyball courts for miles like in Manhattan Beach. There’s no Muscle Beach. In Encinitas there are cliffs, and below those cliffs are narrow beaches that can disappear during high tide, particularly in the winter. So while people sunbathe, walk the beach and do repeats up the stairs, it’s much more about riding the waves than playing the latest beach game. While the surf culture influences the vibe throughout the town, Encinitas actually has four primary communities, each with its own feel. Leucadia, to the north, is a stretch filled with more beachy, new age people. The buildings are older. There’s more wood and blue paint. In general, it has a relaxed, earthy feel. On the opposite end of town, Cardiff by the Sea feels more like a bedroom community. Right by the beach, on the cliff, there’s an awesome campground with it’s own, but public, taco shop. Across the 101 is the residential part of Cardiff. The separation limits the wandering over to the cliffs or down to the water. There’s a hill, though, so the views are plentiful. Between Cardiff and Leucadia is Downtown, aka, the party zone. Don’t worry, there are yoga studios in the area, and there’s a Whole Foods, a couple juiceries and multiple coffee shops in which to to discuss your latest spiritual venture. But downtown is where the density of restaurants and bars is the highest. For comfort food there’s the 101 Diner and Encinitas Cafe. There’s Peruvian food and Italian, fish and Mexican, and of course, numerous bars and grills. Many of the restaurants have large windows that open to the street, making them indoor/outdoor eateries. And if that’s not the case, there’s probably street side seating. If you want to eat outside, you’ll find a place. And then there’s Inland Encinitas. Once east of I-5, it’s hard to know when you’re leaving Encinitas and hitting Carlsbad or Solana Beach. The cultures converge. That’s not the case by the water, where natural wetlands separate the towns. Inland, it’s suburban, just with a coastal flare. 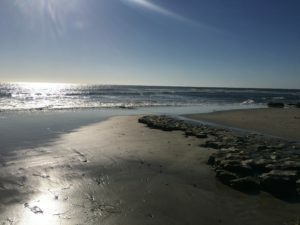 There are still juice shops and yoga studios as well as health food stores and even some transcendental meditation, but the connection to the ocean isn’t nearly as strong. That’s where Best Buy is and Barnes & Noble and Walmart and the mass of strip centers and large theaters. 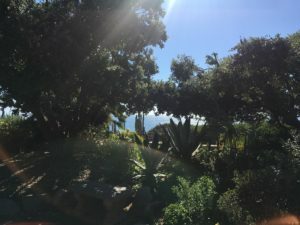 Just south of downtown, across from Swami’s restaurant and above the aptly named Swami’s beach, is the Self Realization Fellowship [LINK]. This is Yogananda’s retreat center. Around the center you can find numerous devotees, a worship center and their gift shop. Above it is the meditation garden with wonderful views, a coy pond and numerous benches for quiet discussion and meditation. We haven’t yet determined the fittest towns in America, but we’d put Encinitas near the top of the list. There is the surfing, and cycling and running along the 101 are all day, every day activities. But it’s the yoga that sets it apart. According to Yoga Journal, Encinitas is the fourth highest yoga-friendly town in the United States. From our view, on a per capita basis, it’s the standout leader. Not only is there Yogananda, but it’s also recognized as the American birthplace of Ashtanga yoga. There’s also power yoga, hot yoga, vinyasa flow and the new age required Kundalini. There’s even a donation based studio, so the barrier is low, making Yoga in Encinitas the norm rather than the exception. Beyond yoga, beyond organic food, there is fresh, extracted vegetable juice. And we have decided, only somewhat arbitrarily, that Encinitas is the juicery capital of the Unites States. Even shops that aren’t advertised as juiceriers have juice presses. 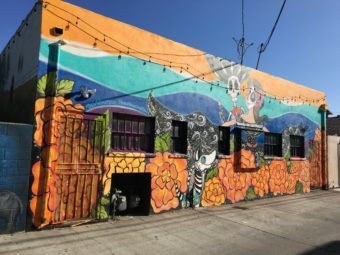 And if they don’t have a press on site, they either press their own in a nearby hippy zone, such as Ocean Beach, or sell a variety of organic juices such as Suja. It’s a town given, that if you want a shot of health, throw back a kale, ginger and celery juice and you’re ready to get back on the board, or the mat. We did our darndest to find as many juice bars as we could. Check out our list on the food page, and as usual, please let us know what we missed. If you’re a camper, there’s a great campground down in Cardiff. 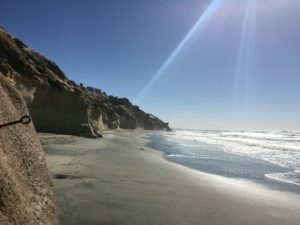 [LINK] It’s located on a cliff above San Elijo State Beach, with great surfing below and great tacos from Bull Taco. Have a couple fish tacos and a drink, but watch the seagulls. They’re vigilant. Highly recommended. If you’re new to yoga, there are a few things to remember. First, not all yoga is the same. Even within a style, your experience may vary based on the teacher. Our first suggestion is to try a few different classes, styles and studios. If you’re looking for fitness and flexibility, we would agree with some sort of flow. Many styles besides Vinyasa incorporate flows. If you just want to relax and stretch, look for a Yin yoga class or something that indicates its more gentle. Regardless of the stye, a beginners class is a good place to start. If you’re not easily intimidated, it’s no problem to jump into an ‘all levels’ class. The other students and the teacher will understand and welcome you. Check a couple of the studios on the yoga page and let us know how it goes. Enjoy. Namaste. Cool, thanks. Will take your recommendations and let you know how it goes. Excited to give it a shot.